We set up a wiki somewhere last year to provide more information about our UIML research. 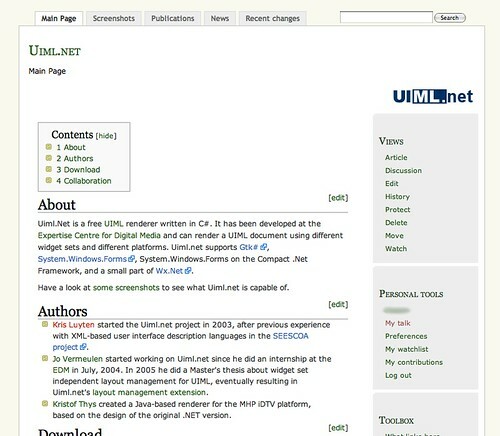 However, since Uiml.net is the main focus of our research efforts, I reorganized the wiki to be more of a homepage for Uiml.net, while still listing our publications. I am hoping to migrate all the content of the old website (still located at Kris’ homepage) to the wiki soon. Lately I have been enjoying Launchpad for hosting my projects and Bazaar branches. It has integrated specifications (blueprints), bug tracking, and a forum (answers). I have moved Uiml.net over to Launchpad as well. Launchpad’s integration of Bazaar branches will be useful for managing multiple experimental contributions from myself, Kris or our Bachelor’s or Master’s students. Finally I’m hoping to put out a more or less stable release of Uiml.net by September. More information can be found at Launchpad.